Our First Remedy Mission Surgery & Training Program in Iraq Begins Today! It has taken many long weeks and months to get to this point, but we are thrilled to announce the beginning of our Remedy Mission to perform (hopefully) 20-30 heart surgeries for children across Iraq this week and to train local surgeons, cardiologists, nurses, and other healthcare professionals for the future. We could not have done this without the help of many partners, chief among which is the International Children’s Heart Foundation (ICHF). ICHF has been in the heart business for over 16 years and has provided more than 4,400 surgeries to children in developing countries. It is our hope that our partnership with ICHF will help us realize our vision to eradicate the backlog of children in Iraq waiting in line for lifesaving heart surgery. In fact, with ICHF on board, this is the first time in our three years of existence that a dream as big as that actually seems like a possibility. We are also grateful to the Kurdistan Regional Government and the Director of Health, Dr. Rekewt, in the Sulaymaniyah province for their significant role in providing on the ground housing, food, and transportation for the ICHF team and for providing the surgical facilities and staff to be trained. Dr. Rekewt has worked closely with Kurdistan Save the Children to arrange most of the housing, food, and transportation and we are very grateful to Mr. Noaman A. Ali for the vast amount of effort he has expended to help us clear customs and secure cars, hotel rooms, food, and many other things that will make this week go smoothly. The KRG office in Washington D.C., under the leadership of Mr. Qubad Talabany, has been especially helpful in assisting with logistics and air travel. We would like to give special thanks to Zhala Sabir for her tireless work on the success of this mission this week! We have also been inspired by Living Light, Intl. in the previous weeks as they have worked in Iraq and internationally as Iraqis to raise money and awareness of the plight of children in Iraq suffering from congenital heart defects. 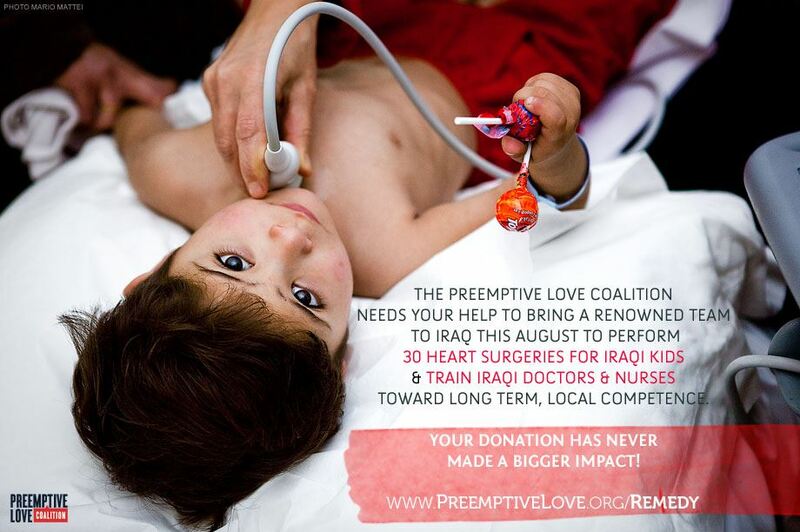 If you’re on Twitter this week be sure to use the #Remedy or #RemedyMission hashtag to describe all the good news coming out of Iraq this week via @preemptivelove and @babyheart_org.